We flew from Chitose back to Haneda airport, left our bags in a locker, and headed back to Tokyo one last time. Due to some overconfidence on my part with the subway system, we ended up about half an hour south of the city before we noticed we were headed the wrong way. Deciding to make the best of it, we stayed on the train and ended up in Yokohama. It’s the second largest city in Japan, the home of lots of international corporations, and is apparently the “world’s larget suburb” after New Taipei. We wandered the bar district, which was similar to Golden Gai but not quite as boisterous, and found a lovely jazz club called “Junk”. 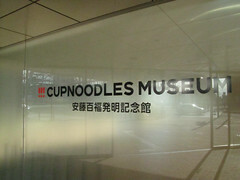 In the morning we got Krispy Kreme, and walked across an artificial island to the Cupnoodles Museum. 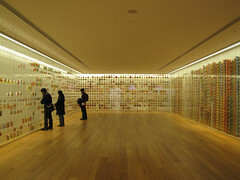 A testament to the innovative spirit and imagination, the curation is actually really well done. 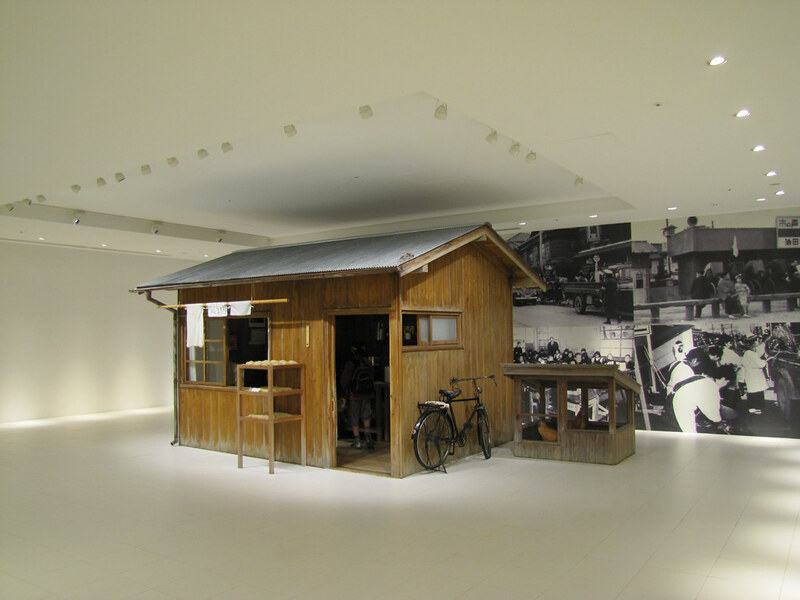 The building is hyper-modern, and was designed by the art director for Uniqlo. 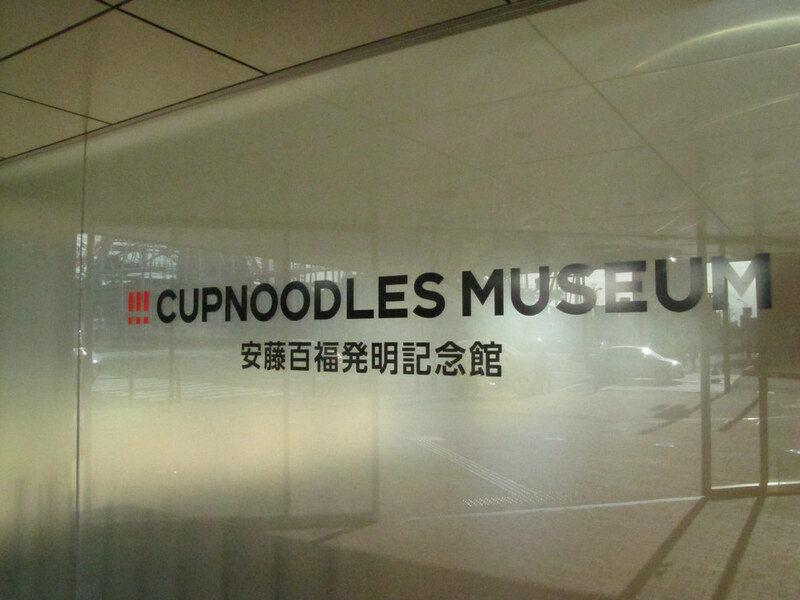 We got to design our own cupnoodles, choosing flavors, drawing on the styrofoam cup, and watching it get heatwrapped and bubble packed. Very cool. 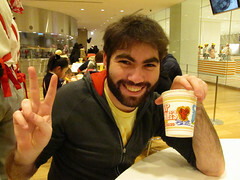 We headed back to Sapporo for our last day in Hokkaido. 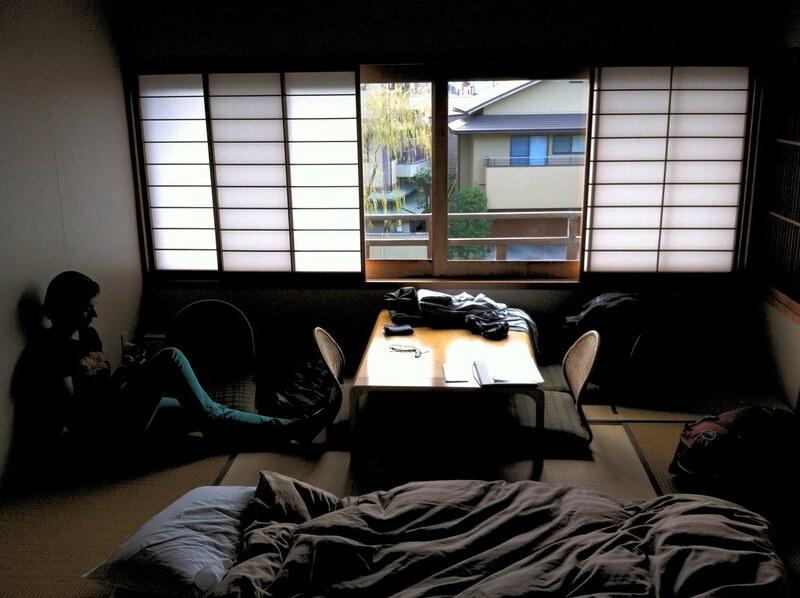 Found an excellent ultra-modern hotel with an onsen on the top floor, open to the winter air. 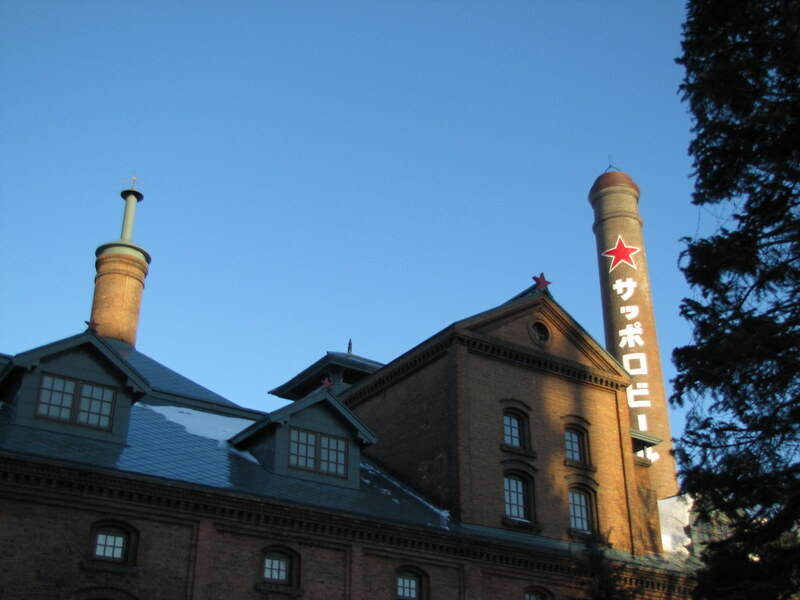 Walked to the Sapporo beer museum for a tour of the former factory, and the all you can eat and drink Jinguskhan special at their bier garden. It was not priced for Americans, and I think we got our money’s worth. After sleeping off the lamb, we packed our bags and headed towards the airport. 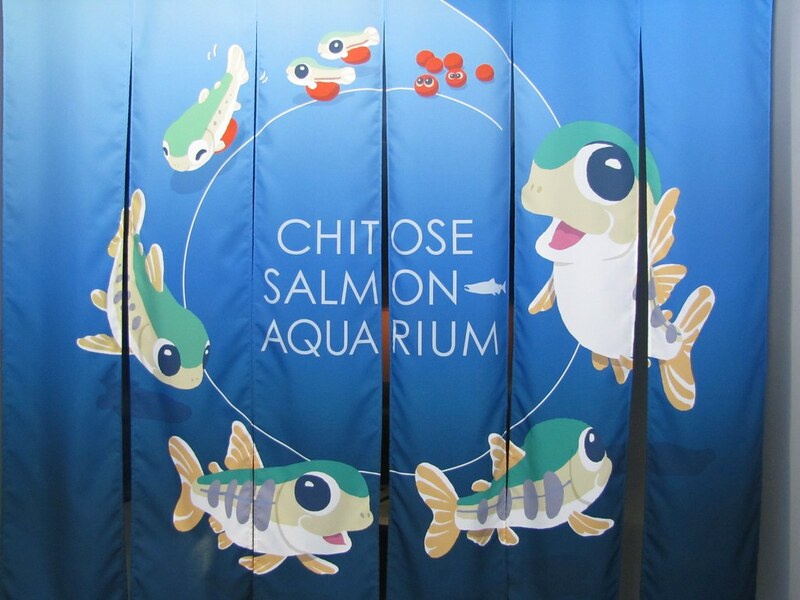 On the way, we stopped at the Chitose Salmon Museum, for an inside look at our favorite fish. 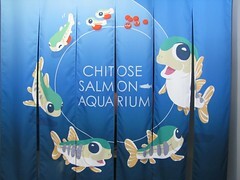 They have a very informative film which showed the whole salmon life cycle, from spawning to the open ocean, and back to spawn again and die. The cartoon salmon named Sammy treated the existentially fraught topic with grace. That, or we didn’t understand the Japanese. Satisfied with our skiing, we descended the mountains back to the coast. 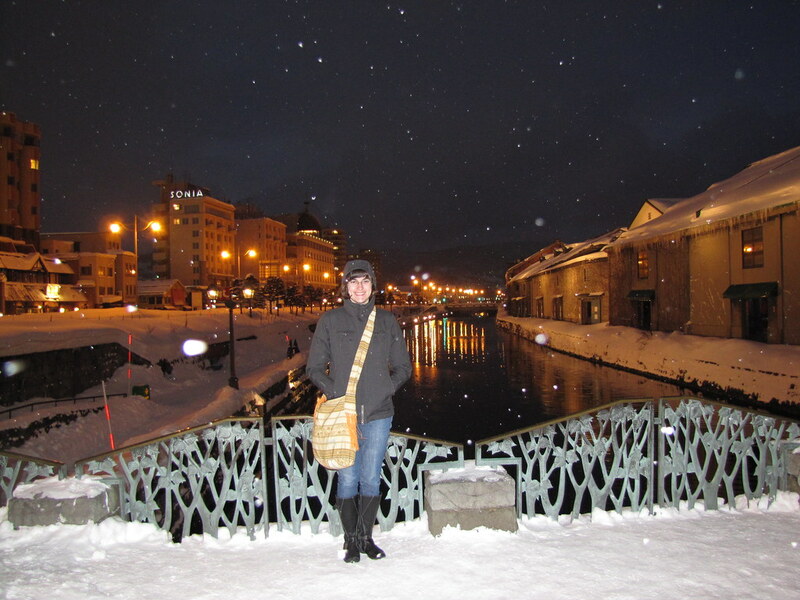 On our way back to Saporro, we stopped at the smaller town of Otaru. It used to be a busy herring port in the early 1900s, and has great examples of victorian architecture. We stayed in a former bank, but sadly the vault was booked. We walked along the canal and through the old downtown to a small six seat restaurant. The owner told us it was “lamb only” as if that would be a problem. It was not. After greasing the grill with a bit of lamb fat, she let us cook our own thinly sliced delicious lamb, leeks, and crunchy bean sprouts. 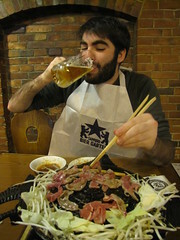 Washed down with fresh Sapporo beer, it was a filling meal. 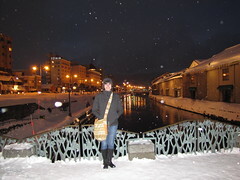 Back towards the hotel, we stopped to take a picture at the canal in the falling snow. 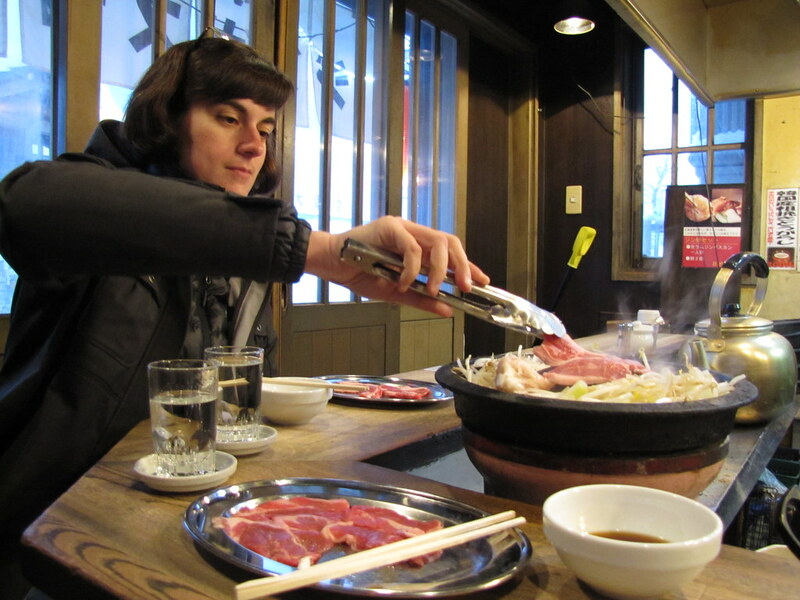 Since it was quite cold, and we feel like walking much further, I ducked into another restaurant for a second meal. We proceeded to have the second best fresh fish of the trip, with gigantic crab hairy crab legs, succulent sea urchin, and plenty of hot sake. I may have embarrassed myself slightly by incorrectly cracking the crab, but the staff was very helpful and friendly. The last day of our rail pass, we aimed to make the most of it. We booked a couchette on the overnight luxury train to Sapporo and settled in for a long ride. Saw Mt Fuji at sunset, and the slept through the ride past Fukushima and through the world’s longest undersea tunnel (23km!). 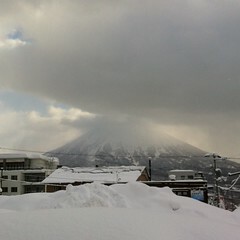 Woke in southern Hokkaido, stopped in snowy tracks. 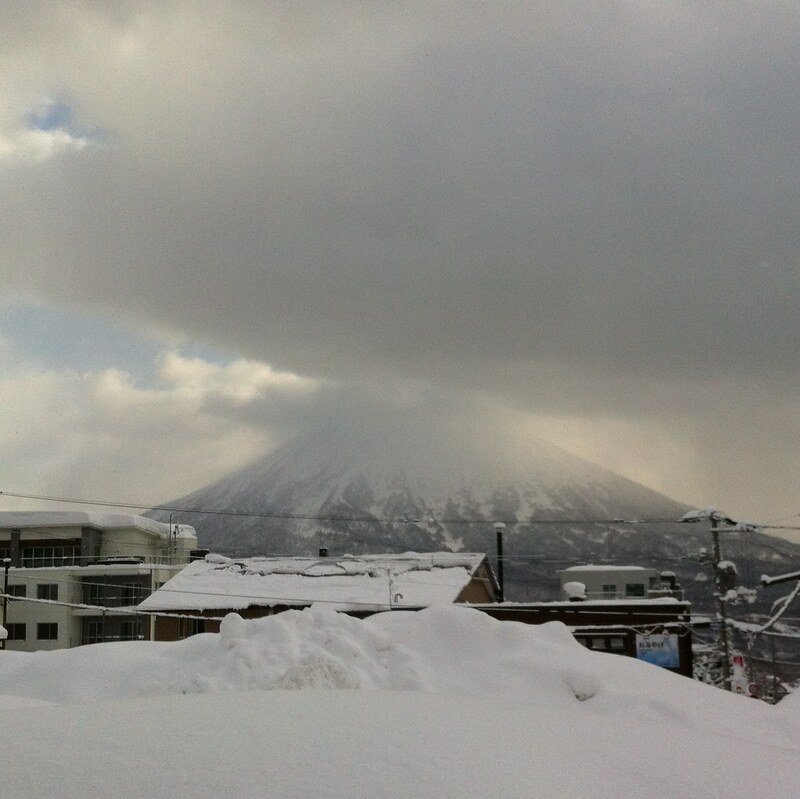 We waited for a few hours for a new locomotive, arrived in Sapporo a little late, and eventually made it to Niseko after 25 hours of consecutive travel. As we got close to the resort, accents and tourists changed, and we felt like we were entering Australia, as apparently a lot of their folks come up here for the winter holidays. Can’t blame them, as the snow is fantastic. Only spending one day at the mountain, but what a day it was. Thigh high light powder, -15C temperatures, and winds gusting hard enough that my beard froze with ice and I had to buy a new pair of goggles. I loved it, but Ruth was less thrilled. 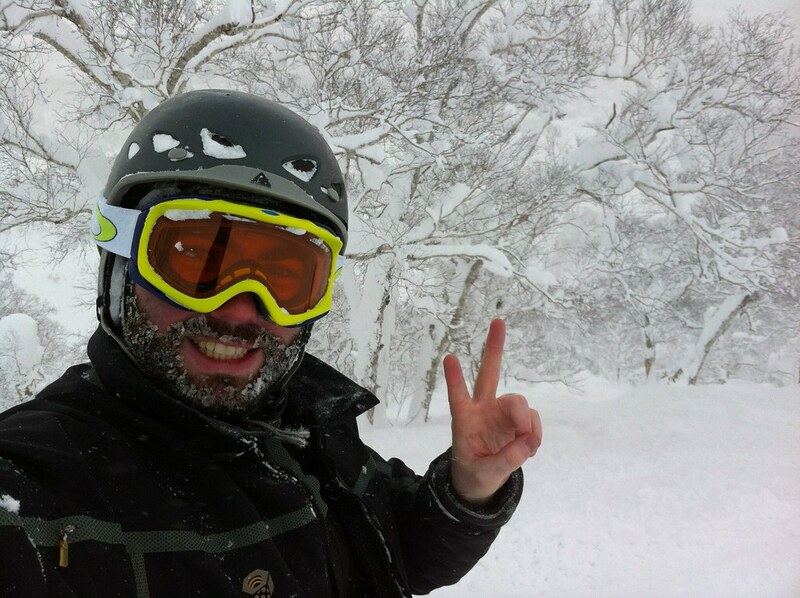 Got in 5 or 6 of the best powder runs of my life by following friendly locals into the trees (apparently most Japanese skiers stick to the piste, so the woods were relatively untouched). Will have to come back with my new Megawatts, or at least put them to good use back at home. With one more day left on our rail pass, we thought, why not take an unplanned excursion? 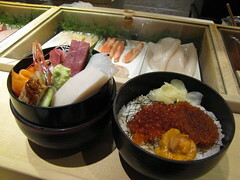 We had intended to go back to Tokyo, but I am loving the small towns and the ryokan accommodations. We looked in Lonely Planet for a day trip from Tokyo, and were not disappointed. 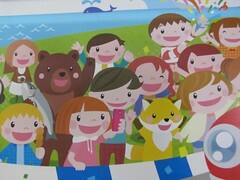 Ito is another hot-spring town, but the air isn’t as cold and the water isn’t as warm in Yudanaka. We stayed in K’s House Ito Onsen, which is one of a small chain in Japan. Their Kyoto branch was comfortable and clean, if a bit backpacker-ish. The Ito branch is lovely, in a 100 year-old restored bathhouse, with views of the river through the classic paper windows. 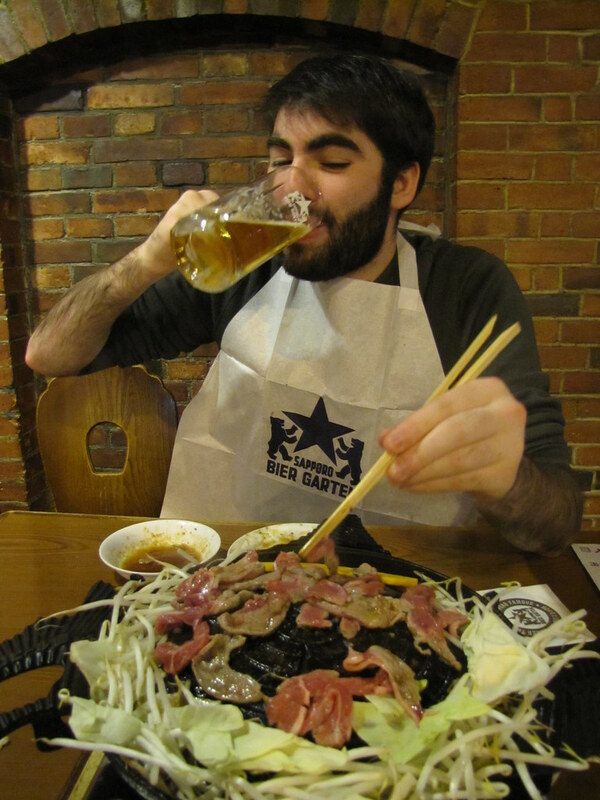 We asked for a recommended place to eat, and ended up eating basashi, or horse sashimi (much better than in Slovenia). 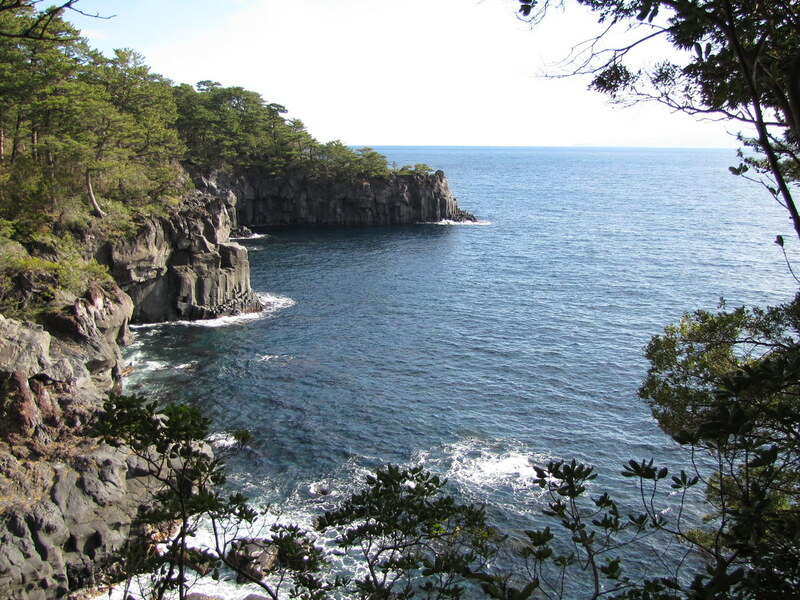 Before going back to Tokyo for our long train ride, we went a little further down the coast for a quick hike. 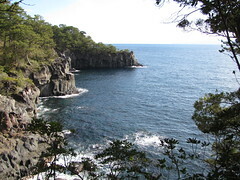 The rock here is volcanic, which made some nice features as the erosion meets the sea. Not quite as impressive as Big Sur, but I might be a little spoiled on California. Fry: I'm never gonna get used to the thirty-first century. Caffeinated bacon? Baconated grapefruit? Admiral Crunch? Leela: Well if you don't like that, try some Archduke Chocula.